STEM – Science, Technology, Engineering, and Mathematics – has become an increasingly important idea in educational circles. In many countries there is an increased focus on teaching these subjects and better preparing young people for careers that make use of these fields. Can one be be a medievalist and still be involved in STEM? In recent years we have seen many exciting projects involving medieval studies and these fields, where scholars are contributing to learn more about the past as well as offer solutions for present-day needs. 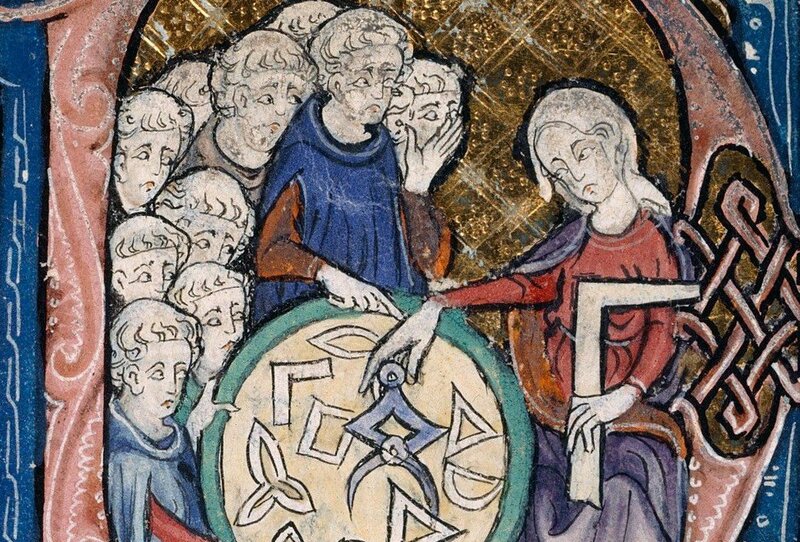 Here are 15 ways that medieval studies and STEM are working together. A one thousand year old Anglo-Saxon remedy for eye infections which originates from a manuscript in the British Library has been found to kill the modern-day superbug MRSA according to a research collaboration at The University of Nottingham. Dr Christina Lee, an Anglo-Saxon expert from the School of English has enlisted the help of microbiologists from University’s Centre for Biomolecular Sciences to recreate a 10th century potion for eye infections from Bald’s Leechbook an Old English leatherbound volume in the British Library, to see if it really works as an antibacterial remedy. The Leechbook is widely thought of as one of the earliest known medical textbooks and contains Anglo-Saxon medical advice and recipes for medicines, salves and treatments. Early results on the ‘potion’, tested in vitro at Nottingham and backed up by mouse model tests at a university in the United States, are, in the words of the US collaborator, “astonishing”. The solution has had remarkable effects on Methicillin resistant Staphylococcus aureus (MRSA) an antibiotic-resistant bug. A team of researchers from Poland and the Netherlands have developed a system that is able to answer what the hair and eye colour is from individuals who lived over 800 years ago. It is one of several projects that make use of the Middle Ages to better understand DNA and test technologies involved in genetic studies. Scholars from the universities of Princeton and Birmingham are using GRID technologies to better understand the events of one of the most important battles of the Middle Ages. By making use of computer-based models, the Medieval Warfare on the Grid Project is creating a digital environment that will allow them to follow how the Byzantine army marched through present-day Turkey on their way to the Battle of Manzikert in 1071. This technology will allow them to simulate the movements of army groups and units as well as individual soldiers and even pack animals. In addition to learning about the logistics of medieval armies, this project will also explore new infrastructures and algorithms for constructing and executing very large Multi-Agent models, particularly when these models are composed of distributed data and computational components. Archaeologists in England were able to discover the remains of a medieval city and castle without having to use a single shovel. The Old Sarum and Stratford-Sub-Castle Archaeological Survey Project was able to make use of non-invasive techniques such as earth resistance survey, magnetometry, Ground Penetrating Radar (GPR) and Electrical Resistivity Tomography (ERT) to find the location of the remains, in the words of one the team members, “shows where individual buildings are located and from this we can piece together a detailed picture of the urban plan within the city walls.” It is one of many examples where archaeologists are making use of technologies that will allow them to explore new areas. Technology and science are being used by many medieval art historians to reveal new details about paintings and manuscript illuminations from the Middle Ages. For example, the Collections Research Laboratory at the Getty Conservation Institure is able to use a wide range of non-invasive techniques to examine works of art, such as infrared, ultraviolet and x-ray imaging that allows research to see things that cannot be seen in regular light. It has helped researchers understand what materials medieval artists used to create their works, and how the look of this art has changed over centuries. What can dirt on pages tell us about medieval manuscripts and their readers? Kathryn Rudy from the University of St Andrews has invented a technique that can measure which pages in medieval manuscripts are the dirtiest, and therefore, the most read. Using a machine known as a densitometer, she is able to measure the darkness of a reflecting surface on these pages and reveal a wealth of information on how they were used, including pinpointing the moment that people fell asleep reading the same book. Researchers and scholars from around the world have been collaborating to learn more about the Black Death and plagues that struck the medieval world. The efforts to better understand its epidemiology have led to the reconstruction of the genome of Yersinia pestis, the bacterium that causes bubonic plague, and the discovery that the Black Death and the Plague of Justinian in the 6th century were caused by the same bacterium, and even how it became so virulent. Beyond understanding how diseases worked in the past, this research will also be used so that medical experts can better deal with future epidemics. Libraries and archives around the world have been using the latest computer technology to digitize tens of thousands of medieval manuscripts. As techniques for scanning and viewing these manuscripts improve, the audience interested in seeing them online has risen dramatically, including researchers who want to study them as well as the general public, who are fascinated by the beauty and skills of these works. The amazing discovery of Richard III, the 15th century King of England whose body went missing for centuries, brought together experts from a wide range of fields. It began with the historians who figured out where his remains were located and the archaeologists who made the dig in Leicester. More team members were brought in, including the geneticists who were able to match Richard’s DNA with a living ancestor and confirm his identity. They were able to learn a vast amount of detail about his life and death, including what he ate, what wounds caused his death, and even how he looked like.